The world of the internet, thanks to the revolution in the mobile devices, is experiencing transaction volumes and service speed that you could not have imagined 10 years ago. This hike requires corporate IT administrators to consider new solutions and ways of managing web application performance in order to keep up with the changes in market. As a result, monitoring web application server (JAVA, .NET, PHP) is getting more and more important. Web Application Server (WAS) resides in between end-user and back-end systems, so all of transactions goes through the WAS zone. Monitoring the WAS zone has proven to be the most effective way to build and maintain scalable web application systems. 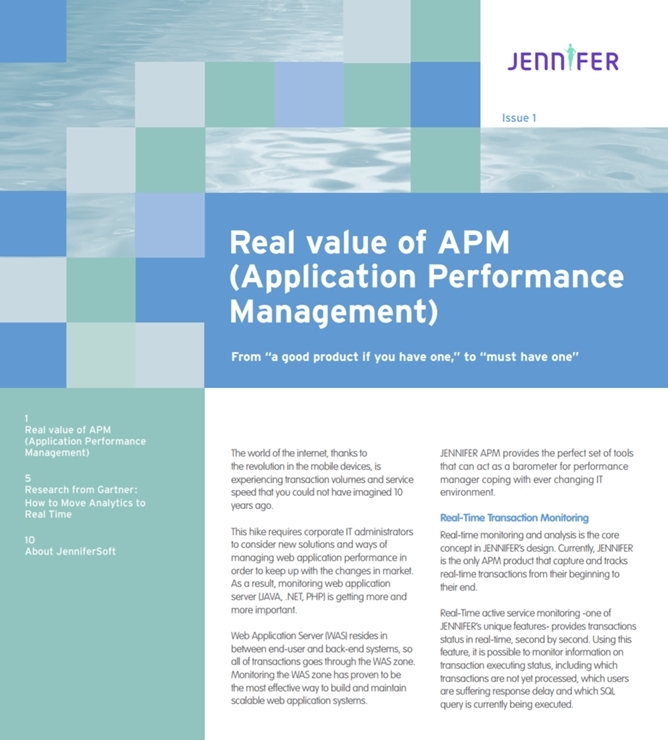 JENNIFER APM provides the perfect set of tools that can act as a barometer for performance manager coping with ever changing IT environment.